The square was redesigned with gardens, but those were removed in 1936. 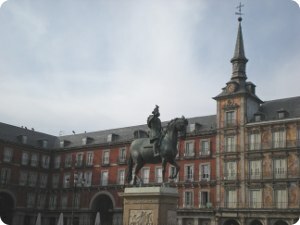 At the center of the square is a bronze statue of King Philips III, constructed in 1616 by Juan Cristóbal González, Jean Boulogne and Pietro Tacca. It is a municipal and cultural building on the north side of the Plaza Mayor. It is four stories high, the ground floor comprising porticos and the top floor in the form of an attic, with its sides crowned by angular towers. At the top center of La Casa de la Panadería, there is a Spanish Coat of Arms. They are the royal Spanish arms from the reign of Carlos II. 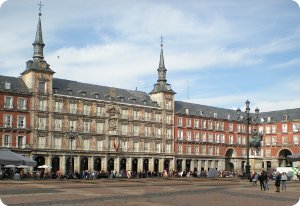 The Plaza Mayor has been the scene of multitudinous events: markets (Christmas Market), bullfights, soccer games, public executions, etc. The Plaza Mayor also has a ring of old and traditional shops and cafes under its porticoes. Celebrations for San Isidro (patron saint of Madrid) are also held here. The Plaza Mayor is now a major tourist attraction, visited by thousands of tourists a year. The calamari sandwich is a culinary specialty in Madrid. This peculiar sandwich is composed of a bread bun opened up from one side, packed with calamari that are battered in flour and egg and then fried. Some like to add mayonnaise or lemon to their sandwich. This type of sandwich is so popular in Madrid, which can be found in most bars in the capital and is very typical of the Plaza Mayor. After a long day touring the city's landmark sites, there is no better option than to stop in the historic centre to have a calamari sandwich with an ice-cold beer.